John W. Stanton is the chairman of the board of Trilogy International Partners, which invests in wireless telecommunication operations in international markets that exhibit strong opportunities for significant growth. Its corporate headquarters are in Bellevue, Washington. Trilogy currently has controlling interests in mobile communications companies in Bolivia, Haiti, the Dominican Republic, and a greenfield mobile communications company in New Zealand. Haiti has become a passion for Trilogy and Stanton. There’s an opportunity for wireless infrastructure to form the “foundation for a new economy, and could become the first ‘copper free’ country in the world,” according to Stanton. 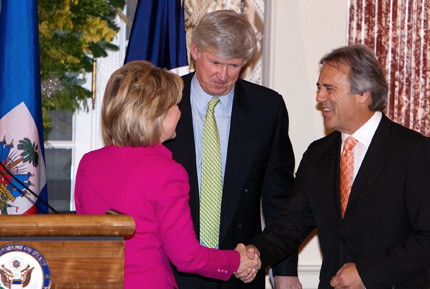 In 2009, Trilogy was given the Award for Corporate Excellence by Secretary of State Hillary Clinton in a ceremony at the State Department in Washington, D.C. Trilogy was the large company selection honored for its corporate social responsibility and transparency and selected from 42 nominations submitted by U.S. ambassadors worldwide. 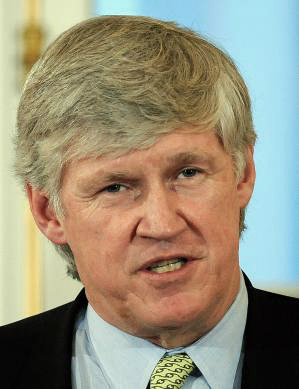 Prior to Trilogy, Stanton was chairman of the board, a director and chief executive officer of Western Wireless Corporation (WWC) and its predecessors from 1992 until ALLTEL’s acquisition of WWC on August 1, 2005. WWC was one of the largest providers of rural wireless communications services in the United States and through its subsidiary, Western Wireless International, was licensed to provide wireless communications services in seven countries, including Bolivia and Haiti. Before WWC, he was chairman and a director of T-Mobile USA, formerly VoiceStream (“T-Mobile USA”), a former subsidiary of WWC, from 1994 to 2004 and was chief executive officer of T-Mobile USA from February 1998 to March 2003. Mr. Stanton served as a director of McCaw Cellular from 1986 to 1994, and as a director of LIN Broadcasting from 1990 to 1994, during which time it was a publicly traded company. From 1983 to 1991, Mr. Stanton served in various capacities with McCaw Cellular, serving as vice chairman of the board of McCaw Cellular from 1988 to September 1991 and as chief operating officer of McCaw Cellular from 1985 to 1988. He is a member of the board of directors of Clearwire Corporation, Columbia Sportswear Inc., and Hutchison Telecommunications International Ltd., each of which is publicly traded. Stanton has a bachelor’s degree in political science from Whitman College and an MBA from Harvard University. This Conversation took place at Seattle Pacific University in November 2010 between Al Erisman and John Stanton, and was updated in June 2011. Ethix: You were the founder and chairman of the board of Western Wireless Corporation in 1992. What was the path that took you from that point to your current position of running a wireless telephone service for Haiti and Boliva, two of the poorest countries in the Western Hemisphere? John Stanton: I’ve been in the wireless business virtually my whole career. In the 1980s, I began at a company called McCaw Cellular and based in Bellevue, Washington. That created the foundation from which my wife and I, along with some partners, started our own business, which we eventually named Western Wireless. We saw an opportunity to take a different approach to wireless. It’s hard to believe that just 15 years ago, only 10 percent of the U.S. population had a mobile phone and the cost per minute of service was about 55 cents. The dramatic change to where we are today allowed wireless to develop more broadly in the U.S. Fifteen years ago, service was not available in most rural areas. Underdeveloped countries had no wireless capability. This represented opportunity for us. The rural area was the first place we went. We owned and operated under a brand name called Cellular One, and we were able to build out about a third of the geography of the continental U.S. We joked that we were the wireless company with the biggest part of the U.S. geography, though we had only about a 3 percent of the population because of the rural areas where we built. We started wireless service to places like Lincoln, Nebraska; Fargo, North Dakota; and Lubbock, Texas, but also along all of the highways and rural areas that connected those communities. In effect, we got the band back together again with the opportunity to continue to operate under the flag of Trilogy Partners in Haiti and Bolivia.The second opportunity was to go into urban areas and create a competition in the consumer market for the first time. We did that in 1994 by starting the business called VoiceStream. That business was eventually sold to form what is now T-Mobile. The third area of opportunity was the international market. We started in Latvia and Georgia in 1994 and1995, before WTO changed the rules to allow American companies to operate majority-owned businesses in most of those countries. The first country we operated in was Ghana, but then quickly we went to both Haiti and Bolivia in the late 1990s. Didn’t you sell off much of this business? The Western business ended up being three businesses. The VoiceStream business was sold in 2001. We had wanted to separate what was left of Western, the domestic rural business and the international business, into two separate public companies. But because of the complexity of the tax rules we really couldn’t do that. We ended up selling to an Arkansas-based business. In such a transaction, the lawyers and accountants asked us a lot of questions, and when we got to talking to about Bolivia and Haiti the first question they asked was, “Do you really go to places like that?” The answer was “yes.” We also operated in places like Ireland and Austria, which were easily sold. So we, along with some partners, agreed to buy the Haiti and Bolivia businesses back. In effect, we got the band back together again with the opportunity to continue to operate under the flag of Trilogy Partners in Haiti and Bolivia. I have some real concerns about the competitive dynamics of the wireless business in the U.S. today. But we saw great opportunities overseas. Tell me about the impact of the wireless in Haiti. It’s hard to fully appreciate the dynamic of being in a country so lacking in infrastructure and beset by poverty. When we launched our services in the fall of 1999, we were literally the first wireless operator in the country that provided anything other than a very limited service in the urban core. We had the opportunity, almost on a monopoly basis, to build services throughout the country, services into places that had been dominated by gangs. The way the business develops in countries in the developing world follows a pattern. You first start off by providing what amounts to the first phone the village has ever had.There are so many things that are hard to describe with respect to Haiti. We started with a prepaid system, one that is popular around the world. Now we are trying a service that is based on people’s names and addresses. This is challenging because we now have to get proof of identity from our customers. Of the 10 million people in Haiti, only 6 million have birth certificates, since in many cases it’s a two-day walk to a community where you can get a birth report. Sadly, 200 years ago, Haiti was one of the wealthiest countries in the Western Hemisphere. Today it is poorest with an average GDP per capita of about $350. That translates to about a dollar a day for people there. There is virtually no wired infrastructure and no power infrastructure. Wireless represented an opportunity to introduce the first telecommunications infrastructure in the country. By building the business, it also allowed us the opportunity to employ people and to serve customers. This is our model in every place where we do business. Haiti really became close to our hearts as we worked there. Is it possible to make an economic business success in Haiti? It is, though it is challenging. Adding to the challenge, we have some of the highest costs in the world there. Every cell site we operate has its own generator and battery power because there is no commercial power in the country. This means we have to have security in every site. There is a risk of having the fuel taken on the tank that supports the generator and also having the wires taken and sold for the copper. But our cost structure is such that we have been able to support that cost. The way the business develops in countries in the developing world follows a pattern. You first start off by providing what amounts to the first phone the village has ever had. That phone is shared in the village. We have a distribution channel that includes about 15,000 people with portable kiosks or backpacks. Think of them as human phone booths that travel around and sell wireless by the call. The phone for a village is then replaced by a phone per family or per multiple families living in the same dwelling. Eventually in places like Port-au-Prince, you end up with a sufficient density that you’re able to build a business. We have about a million customers in Haiti and we’ve been able to develop that over a 10-year period in a business that consistently generates sufficient cash to allow us to continue to invest. It’s a sustainable business. It’s a challenging environment, but we’re able to make it work. Many businesses begin with a singular priority of making a profit. But it sounds like you have a lot of priorities in Haiti. You’re creating economics, jobs, value for people through what their mobile phone allows them to do, and other support activity because of your presence there. Which of these is most important? All of the above. Those elements have to go hand in hand. We enabled people to be able to make phone calls. If they are farmers or folk-crafts people, they can connect to their suppliers as well as to their customers. That is an essential element, particularly since the major earthquake in January 2010. The country has to have a fundamental capitalist-based economy. If they don’t, they can’t succeed. Our infrastructure represents an important part of that. Working toward this may be more important than all of the work the NGOs [non-government organizations] have done over the years, though we are certainly working hand in hand with these organizations. For example, we have also undertaken activities to support education. In the 21st century, education should be a fundamental civil right. Yet, the vast majority of kids in Haiti are still not getting an opportunity to go to school. We, along with other private sector businesses and some NGOs, are trying to supplement the very limited public education system. We’re trying to create a fabric of education, recognizing that there will not be an extensive network of public education for a long time. We in effect partner with them. We support the development of schools, and those schools become the neighborhood school in some places. I can view it as a way of helping the economy. We succeed as Haiti succeeds, and as Haiti strengthens, we get better. But I think fundamentally from our point of view, our broad involvement in Haiti represents the right thing to do. As a public company, frankly, we didn’t do as much through 2005 as we have in the last five years. My partners and I own Trilogy International Partners, so we can do whatever we want. We clearly reinvest more than most private-sector companies would. But to be clear, we also are in a position where we generate cash in the business. The third is the most exciting in a lot of ways. We created a technology system to address some of the risks of natural disasters. Part of the reason we got the award [2009 Award for Corporate Excellence from the U.S. State Department] was the role wireless played in helping Haiti deal with four major storms in 45 days, three hurricanes and a tropical storm. The devastation from these storms was beyond imagination. With our technology, the people have been able to use short message service on a zone basis. When there are storm surges, the messages allow people to warn others in that storm surge area. Traditionally, short message service technology allows you to send to a group on a list or to send to all your customers within a certain switch area, which for us would be the whole country. We were able to put in zones to enable this type of communication. For example, after the earthquake, food and water would be available in a particular area. You would literally see thousands of people rushing to an area where they heard that there might be water available. Of course stronger, younger people (generally men), were getting there first, and the more vulnerable were left out. We were able to create lists, particularly women that had households in a tightly zoned area, and communicate via text that, “There will be water available at this time from this NGO.” So that’s the way we use technology. We are working on some things that represent extensions to this kind of use which I think are very exciting. In the meantime, Trilogy created a short-message-service application for the Red Cross in Haiti, enabling it to send text messages to targeted customers based on their location. We built the capability to pay relief workers, who were removing rubble or the dead, through their cell phone.Weeks after the earthquake, the application was used to send to a group of subscribers information about measles, tetanus, and other basic vaccines. More than 152,000 people received the shots. It’s a good business, helping people with exciting new technology that in many respects is more sophisticated than what’s available in the U.S. or most of developed world. Aren’t you are also working on having the cell phone support payments as well? Yes, and for this we work very closely with Mercy Corp, an NGO based in Portland. The earthquake in Haiti played a surprising role in putting us together for this venture. Mercy Corp approached us a couple of years ago about possibly working with them in some countries where they were providing services. For a lot of reason they didn’t do work in Haiti. After the quake, they decided to send a couple of dozen people to Haiti to help with the rescue effort on the ground. The question was where to put them. Our buildings there were all designed to American standards, built by Haitians. So we didn’t have any meaningful problems with our buildings after the quake occurred and that made us relatively unique. The dynamic in Haiti was that they had no experience with earthquakes, and after the devastation, people literally wouldn’t go back into the buildings even though our buildings withstood the quakes very well. So we gave Mercy Corp a couple of thousand square feet and whatever administrative help they needed. During the rescue and relief effort, we became close. Their basic model is to do development, rather than simply relief, following the old adage of teaching someone to fish rather than simply giving them fish. They will pay people cash for work, but with the significant devastation, the model wasn’t going to work. They figured that 40 percent of the dollars they would spend would be spent on distribution of cash and security. So together we launched the idea of finding innovative uses for the cell phone . The technology is not that complicated to use the cell phone as a place to store money. The biggest inhibitors to this in most countries, including the U.S., are regulatory issues rather than technology issues. So we built the capability to pay relief workers, who were removing rubble or the dead, through their cell phone. They got paid with a credit on their mobile phone and they could take that credit to remittance offices where they could get cash. There were also certain retailers where they could make purchases directly from their cell phones. In effect we became the mobile wallet. In a society that is essentially still a cash economy, they could receive money and pay their bills, all using their mobile devices. It’s exciting and it’s another example of doing the right thing with the opportunity. Banks were not initially effective since most people did not have a bank account. There are about 10 million Haitians and only 130,000 bank accounts in Haiti. Are you optimistic about Haiti? I have to be honest, the alternative is to give up. Haiti has its roots as a democracy going back to the French Revolution. The French either gave up or the Haitians fought to achieve their independence. There is some dispute about that. During a recent election, literally each of the 19 candidates used the same slogan candidates have been using for a couple hundred years: “Don’t let the French come back.” I’m not sure the French are really interested. But Haiti had really been hit hard with storms followed by the earthquake, followed by a cholera outbreak. The good news is there is lots of NGO attention, and water and medicine resources are vast. The challenge is to get these resources into the hands of those who need them. I was thinking as I was driving over today, I suspect everyone got wet coming into the building today. We’re in Seattle after all. Imagine rain three or four times the worst of our storms. Add to it the big wind. Now imagine living with your family of six or eight in a building that is supported by four 2x4s with a blue tarp over it, and that’s how almost a million Haitians are living today. In many cases people are unwilling to go to camps. We built a fancy camp that handled 1,400 people, but we ended up having to basically turn it into a neighborhood center because people wouldn’t leave what they think is their property. The dynamic there is that people basically live where they’ve always lived. They live where their families have lived. Imagine again a building that’s collapsed and the rubble is clearly unstable and unsafe and having people put the tarps the 2x4s on top of the collapsed building and living there. It is so devastating it’s hard to imagine. But amidst that, yes, there is hope because there is an incredibly resilient population. These people have taken every body blow you can imagine, and yet you meet them and they’re smiling. There is a wide place in a road, what we might think of as a sidewalk, that has a string of maybe 15 or 20 different retailers selling everything from crafts to soda pop, to any other necessity. People make it work. Over time our phone number will become the most important identifier in our lives, more important than our social security number … more important than our address.So if there can be the kind of investment first to build infrastructure, particularly water and power, then to build schools, American businesses will be attracted to come to Haiti. I think it is a remarkable place, very creative, and I think that they can succeed. If the $10 billion in aide that’s pledged really comes, I think there is hope. How does your system for payments compare with other payment systems, such as one used in Japan? In general most of the systems that exist are debit systems, but you have to have the money to spend the money. The system used in Japan is called iMode. That service was one of the first introduced in the world in 1999, and has been very effective. But in general you link to either a bank account or a credit card of some sort in order to buy an airplane or train fare, for example. Most people in developing countries don’t have bank accounts. The most successful system in the world is actually in Kenya called M-Pesa. That system relies on a cash transfer system. They have little cash terminals all over the country that people can put cash in, getting credit like you would on your Starbucks card or any other form of debit card. In the vast majority of the world, people don’t have access to credit and they don’t have sophisticated smart phones. The first billion wireless customers basically came in the developed world. We’re up to almost five billion customers now. The last four billion, and virtually all of the growth in the last five to seven years, has come out of places like China and India. The next billion customers will come from places like Haiti and Bolivia. In Haiti, about 30 percent of the population have a mobile phone now, and in Bolivia it’s about 50 percent. So from my point of view there’s a lot of opportunity and continued growth there. Virtually all is going to have to be done on the basis that we described in Haiti, we’re going to establish a series of terminals around the country where you can put your cash into them and you essentially get an electronic transfer. We send a message to the phone to top it up. How much of the world pays for its phone use on a monthly basis like we tend to do in the U.S.? That’s an American question. We are one of the very few markets in the world where most customers pay on a monthly billing arrangement with their wireless carrier, and that has to do with everything from having a relatively efficient postal system, the adequate property records, to a checking system that works, and a tradition of doing that. It also has to do with the tax system. For example, Italy is 80 percent prepaid because you pay higher taxes on a postpaid or a monthly bill plan than you do on a prepaid plan. In places like Haiti, obviously, none of the things I described as a requisite in the U.S. for the postpaid system exist. There is no postal system there, there are essentially no property records, so there’s no ability to collect from people other than by collecting cash. That business model essentially blends. In the U.S., there seems to be less of a prepaid market. In the U.S. prepaid product offerings are very prominent with the ethnic communities and in urban cities like New York, San Francisco, or LA. In order to tap those markets the carriers have become more flexible in offering the product line. The Bolivians are essentially 95 percent prepaid for many of the same reasons. It’s the second poorest country in the Western hemisphere. But it’s also a politically challenging environment, a place where there’s a lot of political unrest and people want to be anonymous. There is a trend for the government to require that you have a name and address for prepaid phones. I alluded to that in Haiti. A Bolivian carrier must shut off anyone who doesn’t have those records. That’s not true in Haiti. It becomes a challenge in places that are more politically volatile where their governments are not as concerned about human rights. Over time our phone number will become the most important identifier in our lives, more important than our social security number, more important than our home phone number, more important than our address. As that happens, we have to have a unique relationship between an individual and that mobile number. At one point in time, prepaid services for some of the carriers had a 10 percent churn; 10 percent of the customers don’t have the same number on the 1st of November they did on the 1st of October. That churn rate, as we call it in the industry, is down on average to a little over 3 percent among prepaid customers. That’s in effect a referendum on how successful we are as a business in meeting and satisfying needs. Let’s talk about the development of the technology. You have been a player in this industry during major transition over the past 30 years. What has surprised you the most? I got out of school in 1979. In that year the national phone company of the U.S., AT&T, did a study. They concluded that by the year 2000 there would be 1 million wireless phones in the United States. There were 100 million wireless phones by 2000, and the U.S. was one of the slowest markets in the world to develop the consumer ubiquity of wireless. The technology is transformative and fundamental as a consumer product and as a business tool. This market continues to change. One of the things that wireless carriers quietly worry about a lot is viruses.I have had a partnership with the men and women investing in this technology over 20 years. We have partnered with Dennis Weibling and others who date back to the McCaw Cellular days, doing investment in this technology. For example, we have a business that we think owns the best set of algorithms for mobile-to-mobile communication. And where is this technology going? Virtually all the mobile phones people will buy this year or next year will have cameras on both sides of the phone. So you can do a mobile video call. That’s really hard from a technology point of view because it’s a lot of data to push through a relatively small pipe. So the ability to compress that data is one of the businesses that we’ve invested in. This gives consumers and retailers a great opportunity, and it all depends on location. This can be combined with social networking capability to create all kinds of new sharing from the mobile device. This changes other things. Eventually when you leave the house you won’t need your watch, and the younger generation is already there. I gave my father’s watch to my son, and it’s still sitting in the closet — he’s never worn a watch. He doesn’t need one because he has a cellphone, but he’s had a phone since he was about 8. You also won’t need a wallet because you can do all your commerce on the phone. You won’t need a computer because that device in your pocket is more powerful than those laptops computers. Eventually the technology will displace most of the other things we need for information, entertainment, commerce, the basic day-to-day needs. When you were at Whitman you must have had a major in wireless technology, is that correct? Not exactly. I was a political science major. My father was a Boeing engineer and he spent three-and-a-half years asking me, “What exactly does one do with a degree in political science?” A product of The Depression, to him the notion that I was not preparing for a field where I could immediately get a job, was a cause of some concern. So I finally could answer that I was going to go to graduate school in business. The business part he liked, the graduate school part he was less fond of. The opportunity that you have today, that may be a product of necessity, is to do some things that involve taking a chance.Political science was probably one of the most valuable degrees that one could have had going into my field because the process of getting a wireless license was fundamentally political in nature. It was leaving a regulatory path, and that and complex problem solving that is common to all who studied liberal arts at Whitman. It represented the opportunity to take this kind of Rubik’s cube of inherent opportunity and turn it until all the colors matched. To be able to create the opportunity to be involved in riding just an astonishing wave has been a wonderful career for me. There was a time in 2010 where we had a lot of joblessness. What advice would you have for young people as they think about their careers today? I have the answer that is easy to give at 55 years old, that isn’t necessarily great solace on a day-to-day basis. But in 1979 when I got out of school, the unemployment rate was about the same as it is today, 10-11 percent. Inflation though was over 15 percent, interest rates were so high that nobody could afford to borrow money, and as a result businesses were not hiring. I had a fancy degree and all the confidence in the world in 1979 and it was hard to get a job at that stage. I ended up going to work for a consulting practice for a couple of years before going to McCaw. A lot of folks ended up doing things that they didn’t expect to do. The opportunity that you have today, that may be a product of necessity, is to do some things that involve taking a chance. It is the perfect time in your life to be able to take a chance. Young people have the vision to see things that someone my age doesn’t necessarily see with the new wave of technology. The fact is there aren’t enough jobs right now, and that’s a sad statement. But be creative, look at things differently than companies are looking at them today. Many of the great companies today were born basically at the time that I got out of school. Everyone’s story is a little different, but companies that dominate today like Microsoft and Apple were both started by young people in such an economic climate. Many good companies have been started as a result of necessity. If unemployment was 3 percent and the wages were incredibly high, everyone could get a good job right out of school. In that climate, people don’t take chances as much, they take the safe bet. This is clearly silver lining on a very rainy day, but I would argue that there are great opportunities today. I would also argue that at 20, 22, 24, 26, the two critical things that students have are a vision for seeing things through a different lens, seeing things that in many cases others don’t see, certainly those of us over 25 don’t see. Second, young people have the ability to make mistakes, recover and continue to do well. If you get to be a certain age, you have certain responsibilities, you have family or mortgage, you’re not going to take chances. Younger people have the opportunity to take chances.